Nirvana Trust, apart from looking after Nirvana School, does a lot of other work in the local community such as helping orphanages, running eye clinics, cow feeding and distributing food and clothing, especially during times of dire need such as after the Tsunami that hit the area in December 2004. We regularly donate school supplies and other necessities like towels and shoes to a boys’ and a girls’ orphanage in the Pondicherry area. Some of the children have a single parent while others have no parents or have been abandoned. Some are Tsunami orphans. We arrange regular medical check-ups and immunization clinics for all the Nirvana children. We donate food like sweets, samosas and other items like sarees, towels and other basic supplies to a senior’s home in Pondicherry. We occasionally hold eye clinics for the local residents, where we give free eye tests, distribute free glasses and teach proper eye care. We also fund and organize eye operations such as cataract removal which is a common disease in India. Food and clothing and other necessities are distributed in the local community when necessary, especially during emergency situations such as floods or fire or other natural disasters like the Tsunami. 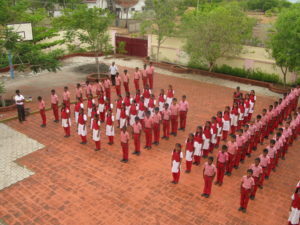 When the Tsunami hit Asia in December 2004, the area around Nirvana school and Pondicherry was badly hit. There were around 300 deaths in the surrounding coastal region and the local fishing community was prohibited from fishing for three months. Fortunately, Nirvana school was saved from being washed away thanks to a sea wall built just six months prior to the Tsunami. The wall bore the brunt of the Tsunami’s force and protected the school buildings which are only 40 metres away from the Indian Ocean. Damage was caused in the surrounding area, mainly in a village named Kovalam, near Chennai, about 70 miles from Nirvana School. Another village about 10 miles along the seashore from Nirvana school was badly hit as well and has become to be known as Tsunami village. After the Tsuanmi, Nirvana Trust donated food such as rice and potatoes and some clothing which was sent from the UK. They also donated household items such as sleeping mats and Nirvana School was used for a few days to accommodate villagers who didn’t have homes. Nirvana Trust also visited schools close to the seashore in three other villages and donated school supplies to them. One school lost their desks and benches so the trust donated 24 of each. The Nirvana Group of Education runs a Community Education Centre a few streets away from the school. The centre runs after-school classes for kids as well as adult education classes for the local residents – all at minimal fees. We recently started advertising the centre on TV to attract more local residents. The education centre offer a variety of services to students. Basic English conversation and grammar are taught to nearby children as well as to adults to help them get work in small organisations.